It’s time for Pay TV operators to become aggregators of SVOD services. This paper discusses why and how they must do it, and why everybody involved benefits. Television viewers are juggling pay TV and online video services. For example, more than half of households in the US and Denmark have traditional pay TV and multiple subscription-video-on-demand (SVOD) services. SVOD usage in many homes is approaching traditional television consumption levels. The time spent with SVOD would previously have been spent with pay TV. However, consumers are struggling with the complexity that many TV services brings. The threat: people spending time away from pay TV will value it less and may cut the cord. The opportunity: consumers are struggling with complexity and want help finding something to watch across all their services. Bringing together Pay TV and SVOD on the operator STB can solve the complexity issues. Pay TV operators also are uniquely qualified for the role of SVOD aggregator. However, it is not easy to be successful at it. 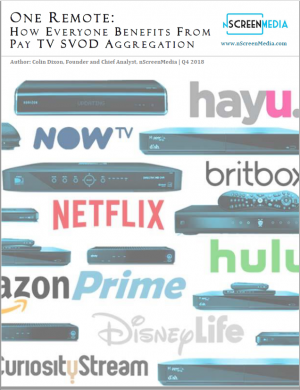 This free white paper looks at how pay TV operators can become SVOD aggregators. It also looks at why SVOD aggregation on the STB is difficult and how the right app platform can help. The paper examines what an app platform is, what it must do, the onboarding process it defines, and the opportunities and challenges SVOD aggregators face in becoming SVOD aggregators.